The "Poor Man's Dean"; the "River of No Return"; these are but a few of the affectionate phrases used by steelheaders to describe the Campbell River. My first experiences with the Campbell River were fraught with intimidation. It is too large, I kept telling myself. What if I hook a big fish, how will I ever land it in those frothing white waters? I had learned my steelheading on the smaller Vancouver Island streams like the Qualicums, the Oyster and the Quinsam, where it was natural to wade across the river and play powerful fighting fish in pools that contain the aggression. I was convinced that this would not be so on the Campbell River! It took me many years to overcome this feeling for one of Vancouver Island's largest rivers. But, when I lost my unfamiliarity with water flows, pools and large powerful steelhead, I was astounded at how successful anglers can be on this exciting river. The Campbell River was made famous in the writing of Canada's most thoughtful and prolific fishing writer, Roderick Haig-Brown. He spoke of this river, his home water, in glowing terms with a rare understanding of the habits and environmental needs of fish, long before salmonids became popular. I was fortunate to work closely with Rod on a number of provincial steelhead concerns and still recall my visits with him in his library on the banks of the Campbell River. Steelhead in the Campbell River are of both the summer and the winter races. The winter steelhead begin entering the river late in November and continue through to mid April. 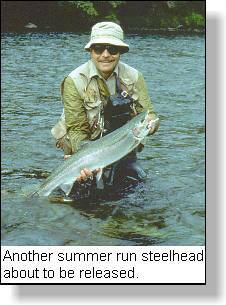 Summer steelhead begin their entry in June, with major runs occurring in late summer and early fall. The winter steelheader has the opportunity to catch both Campbell winter steelhead and Quinsam River winter steelhead in those pools below the confluence of the Quinsam with the Campbell. Without question the most popular fishing water lies immediately below where the Quinsam enters the Campbell. However, in recent years a major Quinsam/Campbell steelhead pool has formed on the Quinsam just prior to its entry with the Campbell. 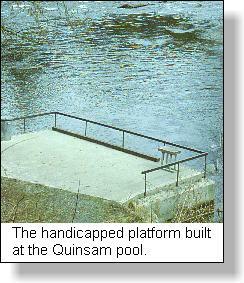 This pool is so productive that a special handicapped fishing platform has been constructed on the upper side of the river. Downstream, the equally popular 'Sandy Pool' immediately below the logging bridge always seems to host a number of anglers during the winter season. Those who are most successful are tide watchers, and are ready and waiting for fresh fish which enter the Campbell to arrive at the 'Sandy Pool' between two and four hours after every high tide. Immediately upstream above the confluence of the two rivers, is the 'Quinsam Pool.' This is classic steelhead holding water, and is easily accessible and fished from the highway side. Looking upstream from the Quinsam Pool, the river takes a crescent bend and shelves at the "Pump House Pool'. On the south side it is shallow (slippery) and 'anywhere' steelhead holding water. Depending on water levels fish will most commonly be found in the tailout shallows or along the edge of the shelf leading into the main current. Deep holding water on the north side also holds many fish particularly at the head and tailout sections. 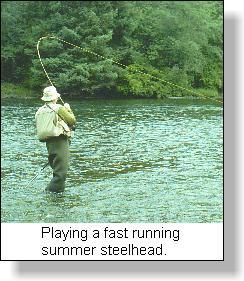 Fly Fishing only water occurs above the 'Pump House Pool' and this is supported strongly by most steelheaders. It is in this water, about a mile and a half to the John Hart Power Station, that summer steelhead are sought by anglers around the world. I can remember 'picket line' fly fishing one pool last year with a group of Germans on my left and a group of Japanese on my right. Communication was no barrier in our numerous contacts during the day for the language of fly fishing is universal! The fly fishing only section of the river, that special upper water, contains a number of classic summer fly fishing waters. However, none is as productive or as fishy as the run between the upper and lower islands. This, the Mid-Island Pool, is a lengthy 300 yard run of water flowing from riffles into a deep fast flowing trough. It can best be visualized as a gigantic 300 yard airplane wing with the water flowing from the thin back, the riffle, over the deeper front, the pool or run. As water levels increase or decrease the fish move back and forth from riffle to pool. It is fishable along it's full length and can take a fly fisher a full day to cover all productive holding water. In this one stretch of popular water it is not uncommon to find 6 or more anglers fly fishing at any time. It is interesting that never have I not been unable to fish this stretch because of angler numbers. Island steelheaders and visitors do follow fly fishing ethics and move downstream after a few casts with the bottom angler in the row moving to the top of the run to work down once again. Two other stretches of fly fishing water are also notable. The first is the deeper run immediately below the John Hart Hydro outflow. This is fast water but one of the areas where steelhead stockpile as they cannot travel upstream much farther. This is rippling dancing surface water that is ideal for skating dry flies like the Western Bee perfected by Roderick Haig-Brown for this river and the much smaller Heber River on the west coast of Vancouver Island. Bomber and high riding white rubber-leg patterns also entice striking steelhead to rise from June through October. The second notable water is the Lower Island Pool. This is the water which is the closest to an actual pool. Here the river pours over a series of rocks then slows as it levels just above the lower island. Steelhead tend to hold in the faster tailout of this pool but, depending upon water flows, can be found anywhere in this fishy stretch including the fast whitewater prior to the pool. This stretch of water, like the Mid Island Pool is streamer water. Be prepared for these lunker steelhead like to capture the fast flow of the current when they are hooked and, they have a habit of running downstream. A good length of backing is a must for these large rainbow-hued trophies. Access to the short Campbell River is primarily on the south side from the Island Highway which borders the fishing portion of the river. 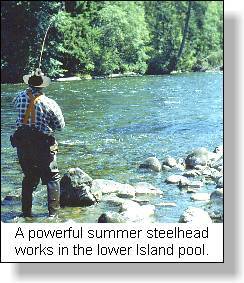 Regulations state that all steelhead must be released above the Comox logging road bridge and fly fishing only is permitted from the John Hart Power station downstream to the powerline crossing at the 'Pump House' pool. Concern is often expressed about writers providing detail on specific rivers or lakes - the giving away of 'secret' fishing holes. I do not fear for steelhead rivers if there is an article published about them. Rather, I feel that steelheaders are natural river guardians and, with publicity comes angling numbers who will ensure protection for our streams. Steelheading is site and time specific, even telling the exact 'where' is no guarantee that steelhead will be there when you arrive. Steelhead are migrating fish whose habits are dictated by season, tide and water flow. Sharing knowledge of these rivers is the greatest guarantee we have that the resource and the river will be a gift we pass on to the next generation. Remember, an unknown river has no friends - no champions!